Handmade Natural Aromatherapy Soaps - we're Orangutan Friendly! At The Natural Soapworks we are taking steps to limit the amount of palm oil that we use in our aromatherapy soaps. Where it is used, we only use sustainable palm oil from a RSPO sustainable source. Palm oil is an ingredient in our soaps, which helps to make each bar harder so it lasts for longer. Our new Natroma soaps, are made without palm oil and are enriched with coconut milk making them suitable for vegan customers. So what's the significance of it being from a sustainable source, you may wonder? 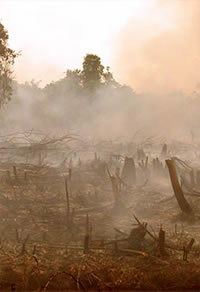 The problem is with palm oil sourced from the Far East, since it tends to be grown on palm plantations which have been planted after the rain forest has been cut down and burnt. This is causing catastrophic damage to the environment, and as the forests are destroyed it means that the local animals die too. Palm oil is in many products on our supermarket shelves (e.g. crisps, cakes, chocolate, biscuits, cosmetics, detergents, soaps etc), with more problems on the horizon due to the interest in bio fuels. Unless action is taken, more and more habitat will be destroyed and ultimately this could lead to the extinction of many animal species. When we discovered in 2008 that even in a small way we were contributing to such destruction, we decided to act quickly to find a new source of palm oil that is grown in a responsible and sustainable way, that doesn't endanger the environment. We can all help in a small way to save the rainforest, and as consumers should try to find products that have sustainably sourced palm ingredients within them. One of the worst things that we discovered about palm oil, was the impact it is having on the orangutan populations in Sumatra and Borneo. There is a serious risk that one of our closest cousins will be wiped out within the coming years. This is why we continue to carefully select our ingredients to ensure our soap is "orangutan friendly". This very worthwhile charity works to rescue and rehabilitate orphaned orangutans in Borneo, whose mother's are killed as the rainforest is cleared. 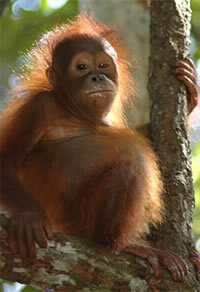 BOS's work, led by Lone Droscher Nielsen, was featured in the Orangutan Diary screened on the BBC. We adopted 2 orphaned orangutans ourselves, and would encourage our customers to consider supporting these charities too. BOS and Orangutan Protection Foundation continue to work to release rescued orangutans back into protected areas of rainforest, so needs more help to sponsor these releases (which can cost between £1,000-1,500 per orangutan). This will free up more space for the steady flow of orphaned orangutans still arriving every week at the project (most of which are rescued from oil-palm plantations). See more by visiting youtube where there is a video about their work.